Before I let you know how I became the Great Protector, I want to send a big thank you to all who sent messages of caring. I want to let you know that today is a much better day for me. I don't know what is different today. But whatever it is, I am sooooo grateful! As I was sitting on the balcony, a hummingbird flew up to the sweet nectar feeder. But the birdy did not land! Instead, it flew all the way around the feeder, looking at the feeding places, and then flew off without eating. I have never seen a hummer do this before. So I went over to look at the feeder. My God! The feeder was covered with 100s of ants!! I grabbed my ant spray and sprayed the support bracket for the feeder. Then I brought the ant contaminated feeder to my kitchen sink and held it under running water to get all those ants off. The nectar went into a bowl, and I cleaned out the ants from the nectar by running it thru a colander with a very fine screen. Then the feeder bottom was disassembled and thoroughly washed. The feeder was returned to the balcony, and very quickly the hummers came back to eat. I put a paper towel drenched with ant spray at the beginning of the bracket to keep the ants away from the sweet nectar! During the late afternoon, I am often found down by the swimming pool. The Sun at this time is behind the building. This brings lots of shade. I don't go swimming. My thing is to put my feet in the water. 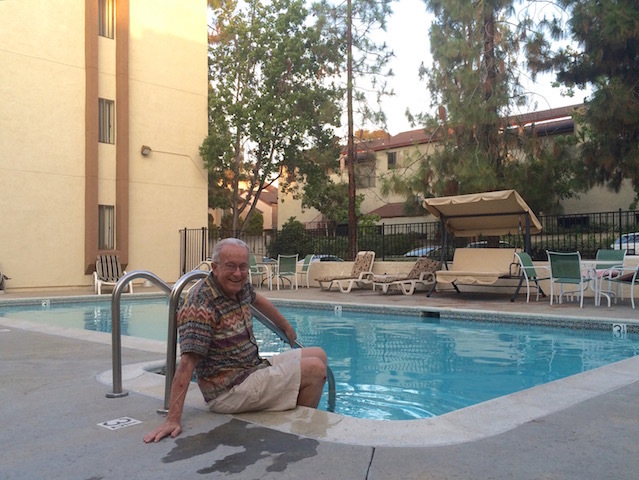 Larry the manager, keeps the pool at 82° which is perfect for feet dipping! 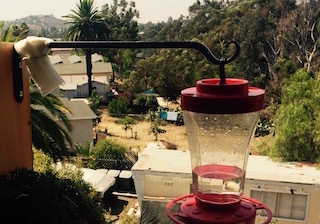 Looks like you can put some water in that little "bowl" on top of your hummingbird feeder. That will keep the ants from descending onto the feeder. Wow! I love that little "Ant Moat!" And, I am very thankful for your seeing it in my pic! Yes, she is right about that, George. That is the way hummingbird feeders are designed, with a little moat to keep the ants away. Just keep it filled with regular water. Hi. Just thought I would check & see how you are doing. So happy to know you are better now. Lucky hummingbirds. Lucky me, too. I am kinda fond of George. The video is not there! I don't know what to suggest?! It did take me a few minutes to post that video. So happy your feeling better George. I love your little patio set up. I miss sitting out and watching the humming birds and listening to my fountain but the heat here is just to much. Happy to hear you are having a better day today. Nice pool. glad you are feeling better. scary when something new pops up with our health. can't put out my hummingbird feeders, something bigger keeps dumping them. I do feel better. But only because I am getting used to being unstable when walking and also having my right hand move without my control. I have to be really careful when moving around making sure that I have my hand on something for support if needed.